It is every patient’s goal is to have their hair restored in a way that is safe comfortable and, of course, undetectably natural. Thankfully, today, minimally invasive hair transplant techniques, the use of small grafts called follicular units and careful artistic design make this absolutely possible for patients. 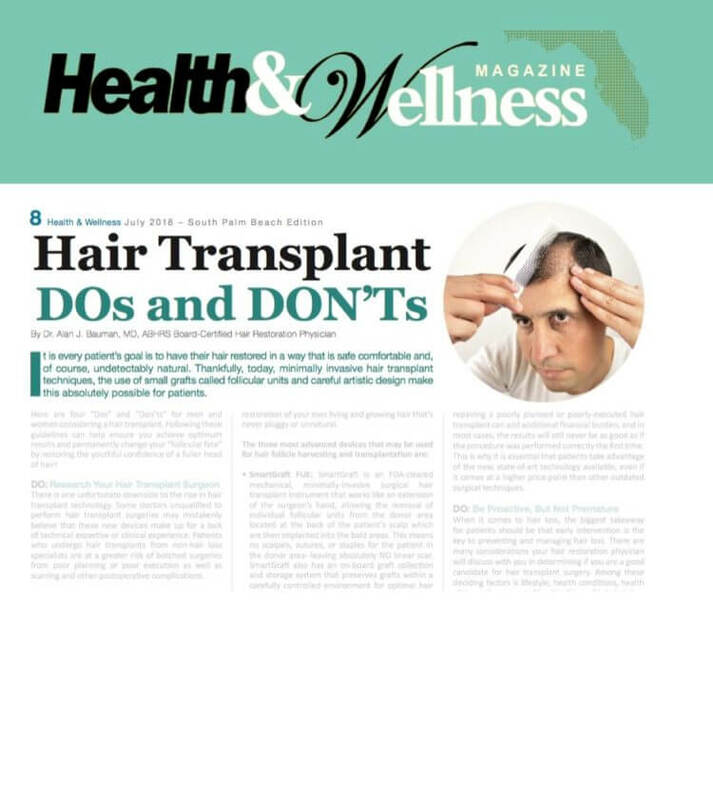 Here are four Hair Transplant “Dos” and “Don’ts” for men and women considering a hair restoration procedure. Following these guidelines can help ensure you achieve optimum results and permanently change your “follicular fate” by restoring the youthful confidence of a fuller head of hair! There is one unfortunate downside to the rise in hair transplant technology. Some doctors unqualified to perform hair transplant surgeries may mistakenly believe that these new devices make up for a lack of technical expertise or clinical experience. Patients who undergo hair transplants from non-hair loss specialists are at a greater risk of botched surgeries from poor planning or poor execution as well as scarring and other postoperative complications. 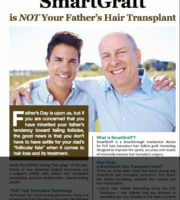 When selecting a hair transplant surgeon, it is important to make an informed and educated choice. Many hair loss patients are unaware of the qualifications, training and expertise needed to properly perform a hair transplant. As with other medical specialties, hair restoration even has its own certifying board, called ABHRS. Before choosing a surgeon, it is important to know their credentials, qualifications, visit the clinic (virtually online, if not in-person), read reviews, ask for before-and-after pictures and most importantly, ask questions. Lots of questions. 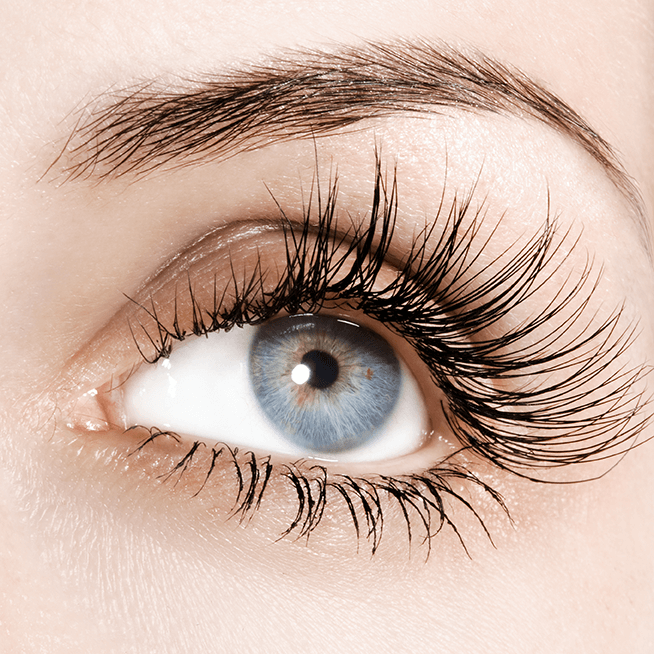 Not only should you look for a surgeon with technical skills, but also the artistic talent to recreate the natural patterns of hair growth and achieve realistic looking results. Also, experience matters. A surgeon who performs a procedure once or twice a month will never in his entire career obtain the skill-level of a full-time surgeon who performs the same procedure multiple times every single day. 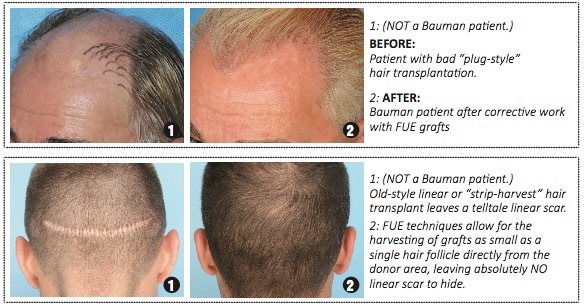 FUE or “Follicular Unit Extraction” is the least invasive type of hair transplant. The less-invasive FUE method is appealing to patients looking for an alternative to the “strip” or “linear” harvest transplants, and the hairstyle-limiting telltale scarring they leave behind. Artistic use of the harvested follicles by an experienced surgeon delivers a permanent restoration of your own living and growing hair that’s never pluggy or unnatural. SmartGraft FUE: SmartGraft is an FDA-cleared mechanical, minimally-invasive surgical hair transplant instrument that works like an extension of the surgeon’s hand, allowing the removal of individual follicular units from the donor area located at the back of the patient’s scalp which are then implanted into the bald areas. This means no scalpels, sutures, or staples for the patient in the donor area–leaving absolutely NO linear scar. SmartGraft also has an on-board graft collection and storage system that preserves grafts within a carefully controlled environment for optimal hair growth rates and quality. ARTAS Robotic-Assisted FUE System: The FDA-cleared ARTAS robot is a state-of-the-art medical device that assists in hair transplant surgery by helping to safely and effectively extract intact hair follicles for transplantation using the FUE technique. The robot’s sophisticated micron-level precision allows patients to benefit from an unprecedented level of safety, accuracy, efficiency and comfort during their hair transplant procedure. The innovative ARTAS robotic FUE system uses advanced digital imagery to “see,” map and analyze the hair in natural groupings on the scalp for harvesting. The system features stereovision sensors to detect and analyze follicular units—calculating density, exit-angles, orientation and location and proceed with precision robotic harvesting based on algorithms programmed by the surgeon. NeoGraft FUE: The original “game-changing” device for Follicular Unit Extraction is still in use today to help surgeons extract grafts from the Donor Area without leaving behind a telltale linear scar. As with any cosmetic surgery, hair transplants can be costly, but patients should always consider that repairing a poorly planned or poorly-executed hair transplant can add additional financial burden, and in most cases, the results will still never be as good as if the procedure was performed correctly the first time. This is why it is essential that patients take advantage of the new, state-of-art technology available, even if it comes at a higher price point than other outdated surgical techniques. When it comes to hair loss, the biggest takeaway for patients should be that early intervention is the key to preventing and managing hair loss. There are many considerations your hair restoration physician will discuss with you in determining if you are a good candidate for hair transplant surgery. Among these deciding factors is lifestyle, health conditions, health of the scalp, amount of healthy “donor” hair, hair loss classification, commitment to follow-up care and age. Patients are always encouraged to seek the counsel of a hair restoration physician while in the early phases of hair loss. Early effective medical intervention can prevent the need for immediate transplantation and also reduce the amount and size of hair transplants needed over time. New, less-invasive technology has made recovery faster and easier; most patients are able to resume regular activities within just a few days following a hair transplant. However it is important for patients to understand that the process doesn’t end with the procedure. Follow up care and commitment is necessary to ensure optimal results from the procedure and also to effectively maintain the non-transplanted hair. 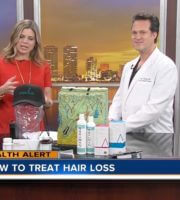 Some of the regimens that may be used in conjunction with a hair transplant may include Platelet Rich Plasma (PRP), which assists with wound healing and graft yield, and low-level laser therapy, which helps stimulate rapid recovery and healthy hair growth. It is essential to follow your doctor’s post-op instructions carefully and thoroughly, to ensure the best long-term results. Select minimally invasive SmartGraft FUE or ARTAS Robotic System as your treatment – which leaves no telltale linear scar, no stitches to be removed, and offers a shorter, more comfortable recovery. For small procedures, grow your hair to more than one inch in the Donor Area–this allows you to easily conceal the ‘stealth-shave’ for a no-shave process. Wear a bandana or hat for one week following your surgery to cover the transplanted areas until the crusts flake off. 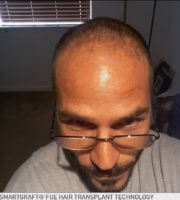 Use healing treatments (like, low level laser therapy, healing mist sprays, topical PRP, etc.) to accelerate skin recovery. Choose a surgeon who can create an aesthetically natural and undetectable hairline. What Do Hair Transplant Credentials Mean? 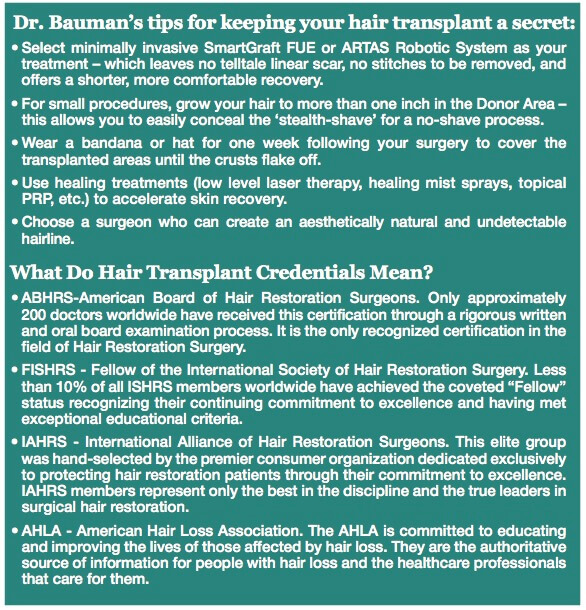 ABHRS – American Board of Hair Restoration Surgery. After more than 20 years, only approximately 200 doctors worldwide have received this certification through a rigorous written and oral board examination process. It is the only recognized certification in the field of Hair Restoration Surgery. 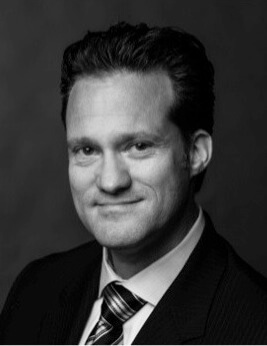 FISHRS – Fellow of the International Society of Hair Restoration Surgery. Less than 10% of all ISHRS members worldwide have achieved the coveted “Fellow” status recognizing their continuing commitment to excellence and having met exceptional educational criteria. 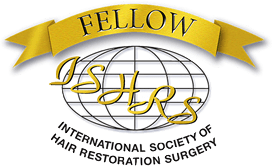 IAHRS – International Alliance of Hair Restoration Surgeons. This elite group was hand-selected by the premier consumer organization dedicated exclusively to protecting hair restoration patients through their commitment to excellence. 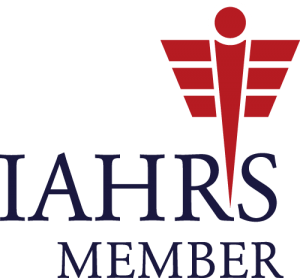 IAHRS members represent only the best in the discipline and the true leaders in surgical hair restoration. 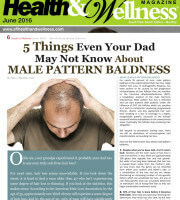 AHLA – American Hair Loss Association. The AHLA is committed to educating and improving the lives of those affected by hair loss. They are the authoritative source of information for people with hair loss and the healthcare professionals that care for them.